This is a big improvement on the first version of Uphill Rush and this time you can buy a whole new lot of equipment for your racing career. 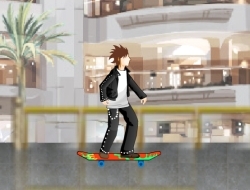 With the money earned in tournaments and collecting coins, you will get to buy new clothes for your main character and also you can buy new bikes, skateboards. All the vehicles are fully customisable and you can change their colors to suit your style preferences. To be great at this game you need to constantly do tricks to fill up your nitrous tank and also do try not to fall to often because your lives are limited to only a few. Uphill Rush 2 0.00 between 0 and 10 based on 0 votes.